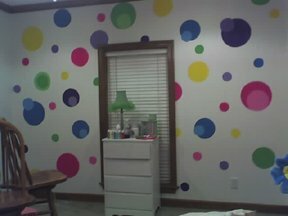 One of our visitors sent pictures after painting polka dots on the walls of her niece's rooms. The bedroom was decorated for two stylish little girls who love bright colors. Her designs can inspire us to come up with our own nursery decorating ideas for dots. However, everybody doesn't have her artistic abilities, so we will share some tips for quick and easy ways to get your dots on the wall as well as instructions for painting your own. We also have some ideas for using polka dot decals on the walls of kids' rooms that are so fast and easy that they will make all but the most devoted painters hang up their brushes and become fans of peel and stick vinyl decals. Before we go any further, consider how easy it would be to use peel and stick vinyl wall decals. If you have your heart set on painting polka dots on the nursery wall rather than using stickers; here is how Jeffery said that she painted hers. The accent wall that she decorated was painted with a flat white paint. A flat painted surface is preferable to a semi-gloss or eggshell paint. To get good adherence, the shine has to be removed from the original surface for each and every painted circle or polka dot. This is a step you can skip when painting over flat paint of any shade. Personally, I can't imagine how tedious it would be to scuff all those dots. A background of flat paint would be the only way to go for me if I were painting polka dots on a large scale. So, let's learn the best way to paint these pretty polka dots on the walls, ceilings or anywhere else you want to put polka dots! The instructions for this polka dot painting technique are very easy. In fact the process is simple, but this is not a really fast project so to get beautifully round painted polka dots like the ones in the picture, you've got to take your time. All right, gather up the brushes (or sponges), your paint, and do all the stuff you do for any wall painting project and let's get started. It's going to take you ten minutes to read this and about that many hours to paint polka dots on the walls so budget your time accordingly! 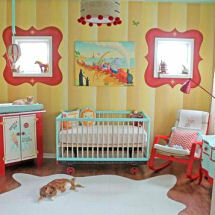 Do you have a picture of a nursery that you painted with polka dots? Tell us about it! This is what Ms Jeffery said she did! She went to the kitchen and found three sizes of round dishes (a chip and dip serving tray) to use as templates. From the photograph, she drew off circles of three sizes in a random pattern. What makes this such a unique painting technique is that she did circle on circle and shadow painting! Those wall painting techniques are wonderful looking on their own, but then she went back and painted cutesy patterns inside some of the circles! I think that painting the polka dots inside of polka dots is what gave the wall such a unique quality! There's something extra there that you would never get with polka dots wallpaper and for a fraction of the price! If you don't feel confident about painting polka dots on the wall, you may want to give painting polka dots by using stencil patterns a shot. This may be easier, but I think you will get smoother edges if you paint the patterns on the wall free handed. You might have better control of your painted patterns using sponges although with sponge painting your polka dots will have a textured look. To get variations in color, she did some custom mixing of the craft paints. The craft paints did a lovely job color-wise, but Ms. Jeffery said that she would not choose craft paint next time because three coats were needed to get even coverage. So, maybe a background with flat wall paint and a quality semi-gloss to use to paint polka dots on the wall would be something to try? Later on, you may want to paint the other three walls with stripes to go with the polka dots? How about some uneven stripes? Something to think about? Polka dot bedding sets with a polka dot comforter and striped accessories or vice versa. Polka dots and stripes are so cool when used together! For a baby's room striped and polkadot crib bedding with small dots is so trendy and modern! Paint the wall a dark solid color and painting polka dots in white or painting polka dots using other light shades. Even colorful polka dots of varying shades of the same color would work! Thanks so much for sharing your decorating project Ms. Jeffery! I can't wait to see your next project! Leah and Haley Grace are lucky little girls to have such a sweet and talented aunt! Not to mention they have a trendy and cool room that they can be proud of! Thanks so much for sending me pictures of the girls bedroom! Please make plans to visit Unique Baby Gear Ideas often to find more polka dot nursery ideas for baby girls' and boys' rooms.